The Noble Shaykh Muhammad Ramzan al-Haajiree (May Allaah Preserve Him), from the well known Mashayikh of Jubail, Saudi Arabia will give a LIVE Tele-Lecture with Muwahhideen Publications. 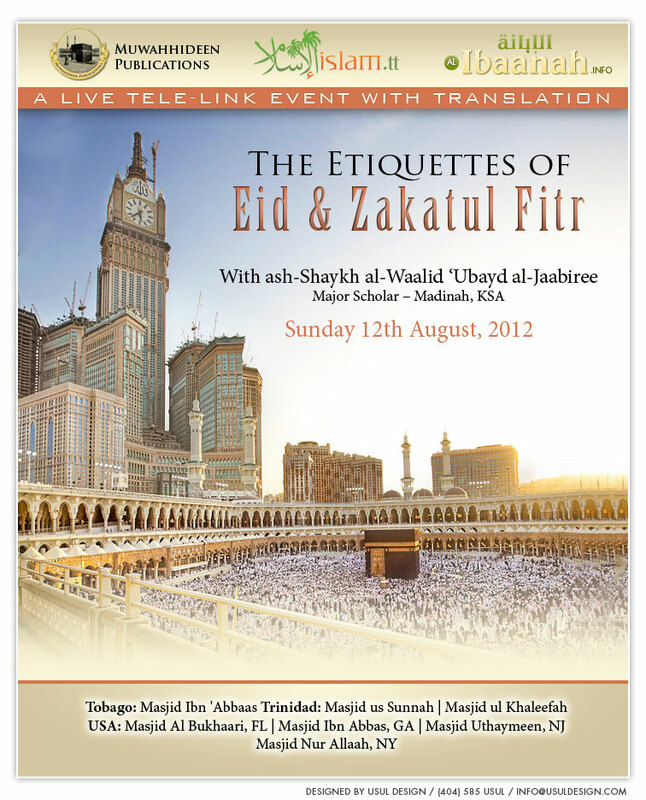 The Shaykh will enlighten us into the many sunan that were practiced by the Prophet (sallAllaahu 'alayhi wa salam) on the joyous occasion of 'Eid ul Fitr. 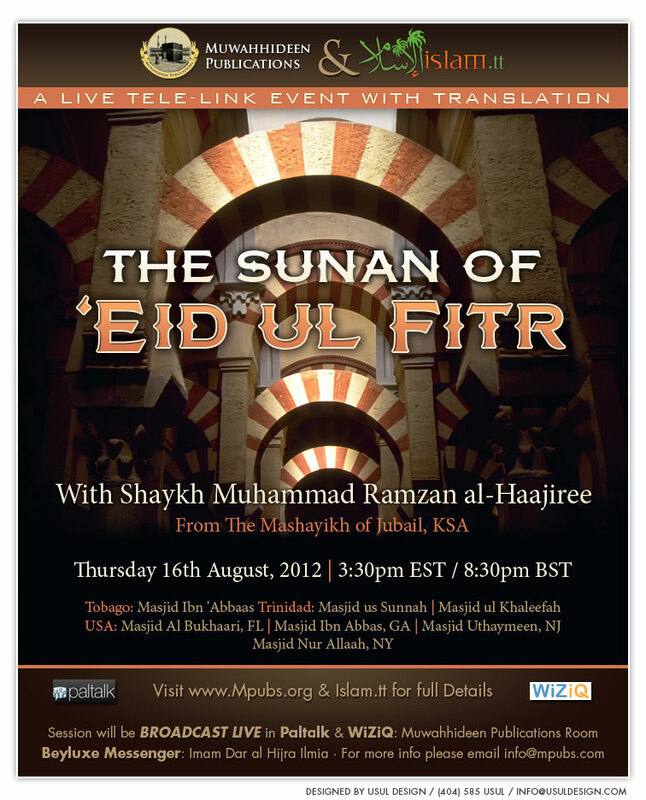 This event will be broadcast LIVE in Masjid Ibn 'Abbaas, Tobago, two masaajid in Trinidad, Masjid ul Khaleefah and Masjid us Sunnah, and four Masaajid in the U.S. Masjid Al-Bukhaari, Florida, Masjid Ibn 'Abbas, Georgia and Masjid Uthaymeen, New Jersey, and Masjid Nur Allaah, NY. On Saturday 11th August, 2012, The Noble Shaykh 'Arafat Muhammady (May Allaah Preserve Him), one of the virtuous mashayikh of Madinah, K.S.A., and from the best students of the 'Ulamah (scholars) of Madinah most prominantly Shaykhanna al-Walid 'Ubayd al-Jaabiree (May Allaah preserve him) will deliver a LIVE Tele-Lecture with Muwahhideen Publications narrating to us some examples of the behaviour salaf us saalih (righteous predecessors) in the last ten nights of Ramadhaan. The Shaykh is highly praised for his efforts and firmness in dawah by Shaykh Rabee' ibn Hadi al-Madkhalee (May Allaah preserve him) and many others of the ulamah (scholars). 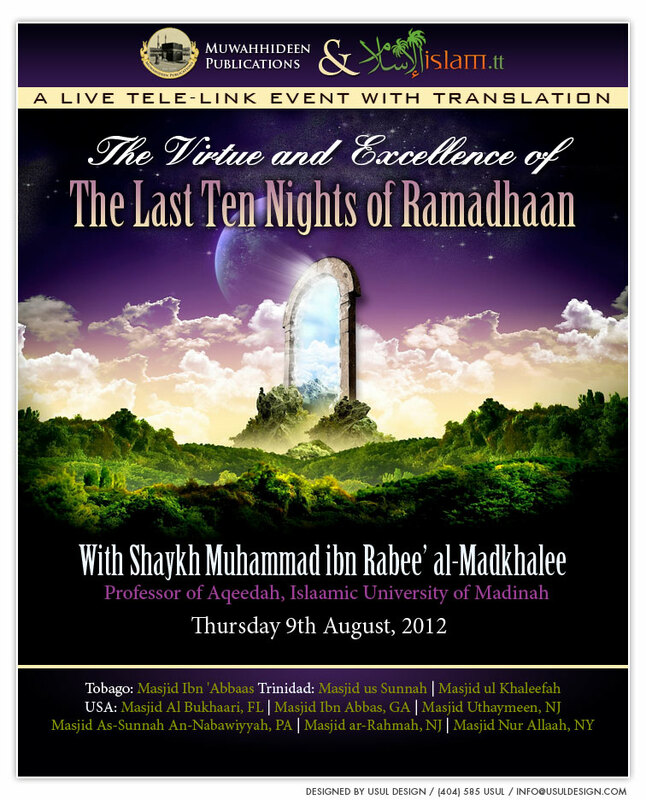 This event will be broadcast LIVE in Masjid Ibn 'Abbaas, Tobago, two masaajid in Trinidad, Masjid ul Khaleefah and Masjid us Sunnah, and four Masaajid in the U.S. Masjid Al-Bukhaari, Florida, Masjid Ibn 'Abbas, Georgia, Masjid Uthaymeen, New Jersey, and Masjid Nur Allaah in New York. Muwahhideen Publications in conjunction with al-Ibaanah.info of Germany has organized a LIVE Tele-Lecture with the Noble Shaykh al-Waalid al-Allaamah 'Ubayd ibn 'Abdullaah ibn Sulayman al-Jaabiree (May Allaah Preserve Him), from the major scholars of Madinah, Saudi Arabia on the etiquettes of 'Eid ul Fitr and Zakat ul Fitr, on Saturday 12th August, 2012 inshaaAllaah. 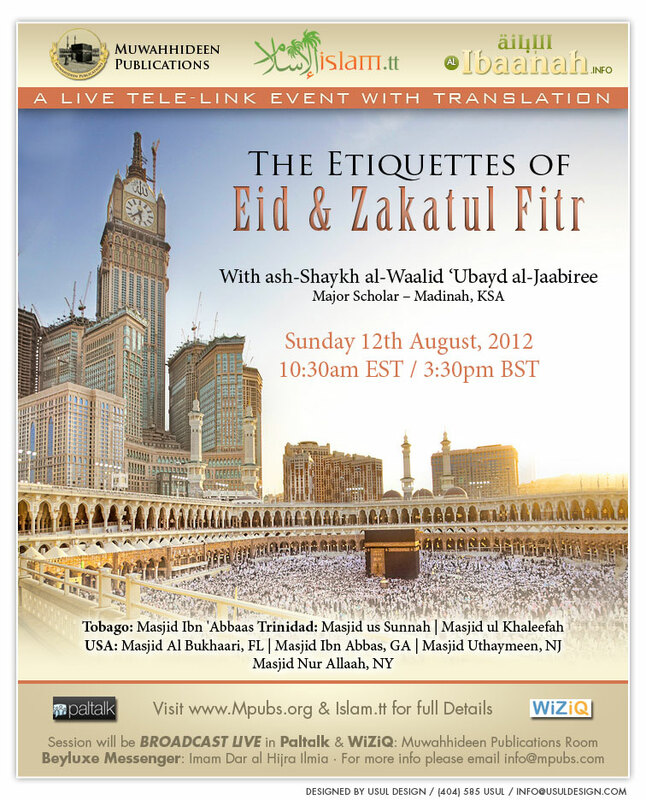 This event will be broadcast LIVE in Masjid Ibn 'Abbaas, Tobago, two masaajid in Trinidad, Masjid ul Khaleefah and Masjid us Sunnah, and four Masaajid in the U.S. Masjid Al-Bukhaari, Florida, Masjid Ibn 'Abbas, Georgia and Masjid Uthaymeen, New Jersey, and Masjid Nur Allaah, NY.